WNY Supply has been manufacturing and selling phase converters for almost 4 decades . We know that technical support is important for your power conversion success. Our technical support team is dedicated to assist you with every aspect of your converting needs, from choosing the right style of converter and to give any help you may need in the proper installation and operation of the converter on your machine. Tech support is a call away 24/7, just give us a call at 716-304-1929. In 2008, we designed the SC series static phase converter. A low cost, compact unit that is easy to setup and use. This style of converter has becoming one of the top selling converters on Ebay with a volume over 1300 units per year. During that time period we listened to our customers input on manufacturing a better unit. 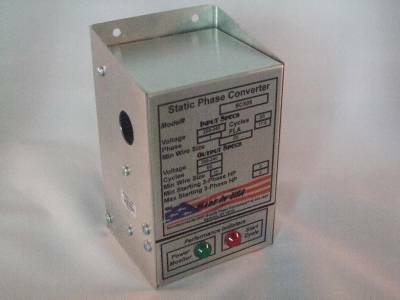 We have now simplified input, output and ground terminals, indicator lights on front face of the converter, knockouts on each side of the converter, heavy duty starting circuit that gives you up to 50 starts per hour* and a lightweight custom designed enclosure made from AL alloy. *Some of our competitors give less than 10 starts per hour! Heavy duty parts: Every part used in making the SCX series is U/L, CSA approved. Standard with our SCX model are full voltage rated capacitors and a heavy duty sensing control circuit, indicator lights to verify operational status, enclosured constructed from aircraft AL alloy making it light weight and resistant to corrosion, all non-insulated crimp terminals are crimped and solder assuring the best electrical connection you can have. Repairablity: The SCX was engineered and designed to be totally repairable.Unlike other manufactures that rivet and/or glue their units, the SCx is assembled with screws thus making it easier to repair and replace parts. Each unit does come with a parts list. Replacement parts: There are 53 individual parts** that make up the SCX static converter. Each part can be replaced individual or as a group. The SCX was designed to save the end user less down time by breaking the SCX into 2 main componets, the phase shift circuit and voltage sensing circuit. By stocking these 2 componets, you can have the SCX repaired and up and running within minutes. The phase shift circuit assembly includes, capacitors, resistor, indicator lights, terminal block, terminal block mounting plate,wire, crimp terminals and label. The voltage sensing circuit includes the potential voltage relay. Quality assurance: To maintain better quality assurance for manufacturing the SCX static phase converter series, we have assigned individual serial numbers for each converter. In the event that one of our suppliers notifies us of a possible defective part or a part not made up to specs, we will be able to trace that part from the suppliers bin number, back to the specific converter that the part was used in, via the serial number. Checkout our Ebay Feedback, as we have one of the highest ratings for a seller. As you notice by our feedback, we specialize only in phase converters and phase converter parts. Static start phase converters are designed to start a 3 phase motor from single1 phase power. The phase shift circuit in the converter fools the motor into thinking that it notices three phase power. As the motor is building up speed, it will be generating voltage back thru the phase shift circuit. When the motor is almost up to speed, the voltage sensing circuit will remove the phase shift circuit. At this point your 3 phase motor will be running on single phase power. With this method your motor will produce approximately 2/3 rated horsepower. Please check TABLE 1 if a static could work for your application.